Located in the north of Paris, Plaine Commune is one of the twelve territories conforming the “Grand Paris” metropolitan area. Plaine Commune gathers nine cities, home to around 435,000 inhabitants. Young and dynamic, the region counts with a strong potential for economic development, yet it also ranges as one of the poorest territories in France. At the current moment, a large part of its population still encounters serious social difficulties and lives in relatively poor conditions. 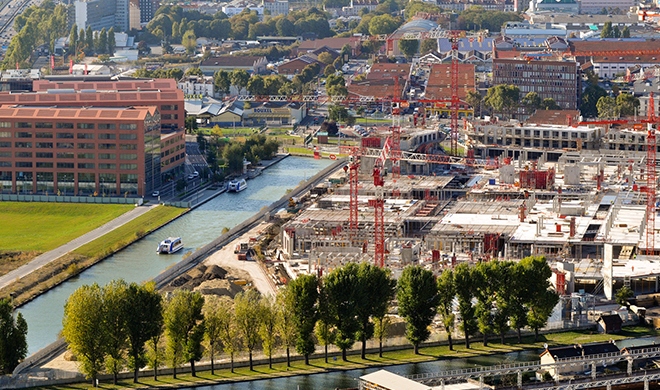 Throughout the last twenty years, continuous urban renewal projects have allowed Plaine Commune to improve the quality of life of its inhabitants and to meet their needs in regards to housing through an ambitious strategy seeking to transform industrial wastelands into urban land. Eradicating inadequate housing, fighting against speculation and abusive landlords have been structuring axes of Plaine Commune’s global strategy in this regard. Since Plaine Commune is an interesting example of how the right to the city - understood as the right to housing - can be concretized and carried out by a local authority, the Committee's Secretariat has interviewed the Vice President of Habitat of Plaine Commune, David Proult. Q1: What is the situation of Plaine Commune in regards to “Grand Paris” in social and economic terms, as well as in regards to housing? Plaine Commune is a working-class, metropolitan territory, with two thirds of its urban area classified as “géographie prioritaire”: a term used by French national authorities to refer to those urban areas that are in need of specific approaches and interventions in terms of housing. A defining feature of our territory is its large social housing stock (representing nearly half of the total), as well as a fragile and close to inadequate private housing stock (with a 16% of households declared as potentially inadequate). Our territory is at the heart of “metropolization”. It has good access to public transport, hosts numerous urban development projects (such as parts of the 2024 Olympic Games infraestructure or the Grand Paris Express) and receives funding from urban requalification programmes (such as the National Agency for Urban Renewal or the National Program for the Requalification of Inadequate Ancient Districts). Consequently, the pace of housing construction is more sustained here than in other parts of the whole Grand Paris area; a trend that has been reinforced by an ambitious strategy championed by Plaine Commune. Q2: What are the main axes of Plaine Commune's housing strategy and how does it fit into right to housing and right to the city-based approach? Plaine Commune has constantly called for an urban policy that guarantees the "right to centrality" in the metropolitan area, something that obviously applies to the issue of housing. This means that the people who live in our territory – and, in particular, in working-class households – must have access to all the city comforts and services as a right and without exclusion: this is the case, for example, of employment, transport or access to shops and business. This obviously implies an ambitious strategy entailing planning and urban renewal, carried out in a way that in no case results in an increase in the cost of housing, something which would force local population to move out from their home. We are talking about the well-known, global expulsion and gentrification dynamics. In consequence, Plaine Commune carries out an ambitious housing strategy that is currently reaching 4,200 new housing slots per year. This strategy is based on diversity of tenure options, allocating up to the 40% of social rental housing for families, students or young people, while offering grants for purchasing a house. Thanks to this strategy our territory is able to welcome new populations, without extending inequalities between neighborhoods or harming local populations in the process. We think it would be useless to carry out these policies if the local population was to be replaced by others and could not benefit from this improvement. Q3: What are your competencies in planning and what funding mechanisms allow you to develop this policy? Do you count with enhanced multi-level cooperation mechanisms with national authorities? Plaine Commune has competencies in habitat, urban development and urban land management. This gives us the capacity to carry out policy in these three axes and to develop our own strategy. The implementation process counts with the support of "Plaine Commune Développement"; a legal structure created by our territory that allows local authorities to sell construction rights to private developers in exchange for strong regulations on market prices they fix on housing slots. This policy allows local housing tenants to choose their own residential modality and opt, if they prefer, for property. In perspective, this approach has placed Plaine Commune among one of the territories with more housing purchases and one of the least expensive territories in the area. On the other hand, Plaine Commune is also financing construction and rehabilitation projects of social housing developed by the inter-municipal financial entity of “Plaine Commune Habitat”, as well as the Municipal Office of Aubervilliers. The territory equally supports other entities that channel social financing towards habitat, the so-called "bailleurs sociaux", granting them loan guarantees in exchange for housing quotas that the municipalities of the territory recover once the process is over. Q4: Do you carry out specific policies in regards to neighborhood improvement and habitat renewal? Plaine Commune is committed, altogether with national authorities, to favor urban renewal of neighborhoods. The program developed by the National Agency for Urban Renewal is set to improve the situation of 14 neighborhoods, mainly constituted by social housing built throughout the 60s and 70s which are usually demolished and then rebuilt. Urban renewal projects are also a good opportunity to introduce greater diversity in the types and forms of housing. The territory is equally focused on fighting against degraded private housing through various operational mechanisms, be it monitoring, prevention, financing for rehabilitation or fighting against abusive landlords (known as "marchands de sommeil"). Q5: Why do you think it is necessary to defend the right to housing on a national and international level on the basis of the alliance between global cities? Urban growth and "metropolization" are global processes that can lead to emulation, increasing attractiveness and wealth generation, but also produce inequalities and social exclusion if regulation and compensation mechanisms are not implemented. An inclusive city would be unreachable without public intervention. I am speaking about cities with good public facilities, adequate public transportation. A city that breathes and that can accommodate its inhabitants and employees in good conditions without having to constantly move them away from jobs opportunities and spaces of urban centrality. An alliance between cities affected is necessary both to promote the concept of "cities for all", as well as to share the existing approaches and public control tools necessary to continue guaranteeing the general interest. This is the message that Plaine Commune defends and brings forwards within the framework of UCLG.